(Nanowerk News) A new $10 million gift from Ronald and JoAnne Willens to Northwestern University’s International Institute for Nanotechnology (IIN) will establish an interdisciplinary research center that will use advances in nanotechnology to develop new cancer treatments. It will be one of the first centers of its kind in the country. The Ronald and JoAnne Willens Center for Nano Oncology, headquartered within the IIN, will allow Northwestern scientists to develop nanotechnology-based therapeutics with substantial benefits over existing treatments. For example, one promise of nanotechnology-based therapeutics is the ability to target tumor cells in a way that minimizes side effects for patients. The support from the Willenses will enable the IIN to accelerate its promising preliminary research that applies nanotechnology to cancer. 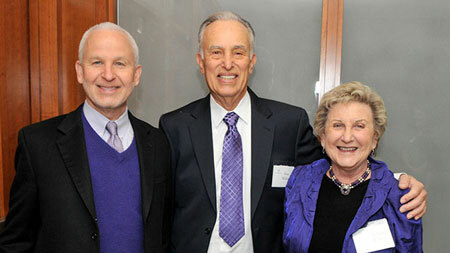 President Morton Schapiro and Ronald and JoAnne Willens. In 2011, the couple gave Northwestern a $10 million gift to advance nanotechnology research. In honor of this gift, the top three floors of an addition to the Technological Institute, housing some of the University’s most outstanding nanoscientists and engineers, were named the Willens Engineering Life Sciences Wing. Both $10 million gifts from the Willenses count toward We Will. The Campaign for Northwestern, a $3.75 billion University-wide fundraising effort announced in March 2014. The funds raised through the campaign will help realize the transformational vision set forth in Northwestern’s strategic plan and solidify the University’s position among the world’s leading research universities. Conventional oncological cancer treatments face many challenges, including drug toxicity, difficulty delivering the therapy to tumor sites, and the ability of tumors to develop drug resistance. While chemotherapy effectively damages cancer cells, it also damages healthy cells leading to adverse side effects, some of which can be fatal. Given these complications, scientists are turning to nanotechnology in the fight against cancer. Biological processes, including those that lead to cancer, are inherently nanoscale phenomena. Nanotechnology has the potential to generate entirely novel and highly effective therapeutic agents with the ability to attack cancer at its genetic roots. Nanotechnology-based therapeutics offer a number of benefits over traditional treatments, including longer half-lives, increased retention, improved targeting efficiency and fewer patient side effects. A diversity of expertise is needed to make a difference in the complex challenge of cancer, and interdisciplinary research is a Northwestern hallmark. The Willens Center will bring together nanoscientists, cancer biologists, engineers and clinicians from two campuses and three Northwestern schools: Weinberg College, the McCormick School of Engineering and Applied Science and Northwestern University Feinberg School of Medicine. The Willenses cite Northwestern leadership along with their personal connection to the University as key factors in their decision to support the creation of the new nano oncology center.